The Hoover Bucs entered their out of state contest with North Marion (FL) with plenty on the line. The Bucs picked up eight points towards the tiebreaker and will finish as the Region 3 runner-up after a 38-14 victory over the visiting Colts. North Marion got it started early on a 66 -yard touchdown pass from Caleb Seiler to Freddie Swain for a quick 7-0 lead in the first quarter. From there Hoover used short fields, a strong running game with timely passing and third down conversions to to rip off 31 unanswered points to close the first half with a 31-7 halftime lead. Quarterback Chris Vacarella rushed for two touchdowns, CJ Sturdivant and Vonte Brackett scored on rushing touchdowns and Barret Pickering added a 27-yard field goal during Hoover’s explosion. After a stagnant first half after the opening touchdown, the Colts offense came to live on their second possession of the third quarter by going 98 yards in 15 plays scoring on a 13-yard touchdown pass from Seiler to Swain to pull within 31-14 but would get no closer. Hoover added another rushing touchdown from Gailen Richardson early in the fourth quarter for the final 38-14 margin. North Marion (8-1; 2-0) was lead by Justin Watkins 134 yards rushing on 25 totes while Swain finished with five receptions for 87 yards and two touchdowns receiving. Vonte Brackett finished with 77 yards rushing (71 in the first half) and Vacarella was 10-of-18 for 122 yards passing without a touchdown or interception. Hoover was able to use the field position game to it’s advantage and went 6-of-7 in the red zone, a missed field goal on their third possession of the game was the only time the Buccaneers did not score int he red zone. North Marion was unable to convert on third downs throughout the night finishing 1-of-14. Hoover will begin the Alabama 7A playoffs next Friday while North Marion will host Lake Weir to close their regular season in Florida before hosting the first round if the 5A Florida playoffs on November 13th. The Winder-Barrow Bulldoggs scored 20 unanswered points-all in the fourth quarter, to defeat region foe Cedar Shoals (1-6; 1-5) 35-20 Friday night. Despite five takeaways (3 fumbles and 2 interceptions) Cedar Shoals was only able to score seven points off those Winder-Barrow turnovers and it was their late turnover that allowed Winder-Barrow (4-3; 4-2) to walk away with the victory. Trailing 25-23 with just over three minutes remaining in the fourth quarter Winder-Barrow quarterback Brock Landis was intercepted on fourth down by Tyreik Sims. Sims returned the interception 94 yards to the Winder-Barrow four-yard line, however Cedar Shoals was flagged for an illegal block bringing the ball back to the Cedar two-yard line. 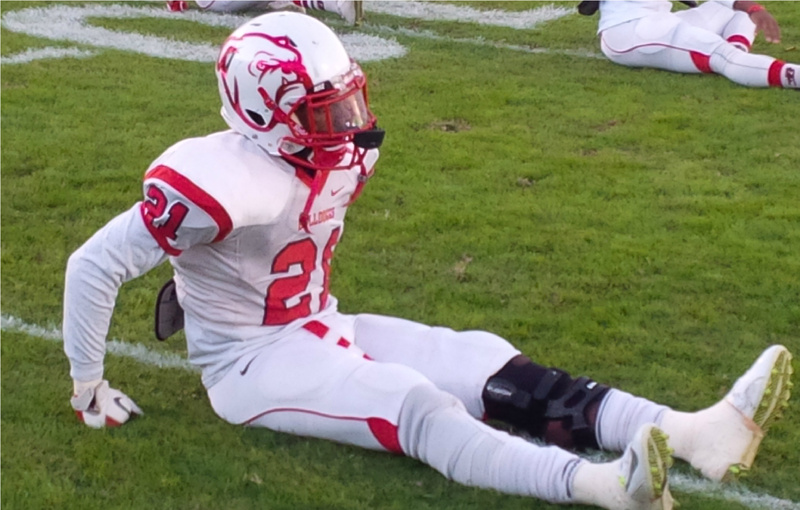 Two players later Winder-Barrow recovered a Jephari Colbert fumble. On third and goal from the one CeCe Green scored his third touchdown of the night giving Winder-Barrow their first lead of the game 30-25 with 1:01 remaining. Green was seeing his first action in almost a month after suffering a knee injury against Loganville in mid-September. The Bulldogs knocked the Jaguars Hail Mary pass to seal the game a few plays later. Cedar Shoals lead 19-10 at halftime behind two Greg Smith rushing touchdowns and a Jaivanni McDavid rushing touchdown. The Jaguars extended their lead to 25-10 after a third quarter rushing touchdown by quarterback Aakeem Glenn. Winder-Barrow closed the third quarter driving and opened the fourth quarter with a Landis to Ray Evans 10-yard touchdown pass to spark the comeback. The Winder-Barrow Bulldoggs football program has more than a heartbeat, it has life and continues to pick up steam under second-year head coach Heath Webb. Webb and his Bulldoggs (3-3; 3-2) travel to region foe Cedar Shoals (1-5; 1-4) tonight looking to stay in the playoff hunt in region 8-5A. Winder-Barrow is seeking to make the playoffs in back-to-back season for the first time since the 1992 and 1993 seasons. The “double G” Bulldoggs headliner is running back CC Green. Green has missed the last two games due to injury and his status for tonight is basically a game time decision. Green leads Winder-Barrow in rushing with 678 yards and five touchdowns in three and-a-half games. With Green being out the Bulldoggs have turned to quarterback Brock Landis to pick up the slack. The mobile Landis has passed for over 300 yards and two touchdowns while rushing for five touchdowns since getting the majority of the action in victories over Salem and Flowery Branch. Cedar Shoals ended their longest losing streak in school history with a region win over Heritage-Conyers earlier this month. The Jaguars are a heavy sophomore and junior-laden team that will continue to lean on athletes Ryan Huff and Greg Smith. Running back Jerphari Colbert and defensive end/tight end Stavion Stevenson have also been impact players for the Jaguars this season. Total Sports Coverage will have the live broadcast of this contest beginning at 7:20 pm et. The Langston Hughes Panthers won their third straight contest defeating previously undefeated East Coweta 29-21 Friday night. Langston Hughes broke open a 7-7 halftime game in the second half by scoring 22 unanswered points on their first three possessions of the half. Isaiah Green capped an 80-yard drive with a 2-yard touchdown run on the Panthers opening second half possession. Green then hit Rashad Burch for a 24-yard touchdown pass to cap a 53-yard drive followed by a 31-yard touchdown run by Demetrius Whitmore early in the fourth quarter to put the Panthers up 29-7. Whitmore finished with two rushing touchdowns. East Coweta would attempt to rally behind sophomore backup quarterback Christian Reid. Reid entered the game midway through the fourth quarter when starting quarterback Will LaGuardia was sacked by Jac’quez Walker and suffered a head injury, LaGuardia would not return. Langston Hughes was assessed a personal foul on the play and two plays later after another personal foul on Hughes, Reid raced untouched 28 yards for a touchdown to pull East Coweta closer at 29-14. The Indians would force Langston Hughes into a three-and-out with 6:16 remaining but were unable to move the ball punting it back to Langston Hughes with just over fives minutes remaining. East Coweta would not close up shop however as they forced the Panthers to punt again and this time capped their drive with a 40-yard touchdown pass from Reid to Justin Crump for the final 29-21 margin. Whitmore scored on a 2-yard touchdown run after a Jeffery Allison interception set up Langston Hughes with a first-and-goal from the East Coweta seven. Whitmore scored two plays later with less than two minutes gone by in the opening quarter. East Coweta evened the game on a 2-yard touchdown run by quarterback Will LaGuardia with less than four minutes remaining in the second quarter. Each team failed on field goals attempts, Langston Hughes due to a bad snap while East Coweta’s attempt fell just short of the crossbar as time expired in the first half. Langston Hughes (3-3; 3-0) took sole possession of first place in region 3-6A and are the only undefeated team in region play after Westlake defeated Newnan 41-21. Hughes will host South Cobb on October16th before traveling to Westlake on October 23rd. East Coweta (5-1; 2-1) will host Pebblebrook on October 16th. Cedar Shoals has been searching for a win for quite a while, 15 games to be exact. The previous 14 games, including the school’s first-ever winless season in 2014, came under the watch of head coach Scott Wilkins. Wilkins, in his second term as head coach of the Jaguars, coaches in a stadium which bears his name; Waters-Wilkins Stadium and is the all-time winningest head coach in the 40-plus year history of the school. Wilkins was 106-50-1 when he departed the program in 2007 after going 9-2. John Waters won 102 games in his 14 seasons as head coach of the Jaguars. Cedar Shoals snapped the streak with a 20-3 victory over Heritage-Conyers Friday night on homecoming, giving Wilkins his 107th win as a head coach, all at Cedar Shoals. Quarterback Greg Smith’s rushing touchdown allowed the Jaguars to lead 6-3 at halftime. Jerphari Colbert added two touchdown runs in the second half for the final 20-3 margin. “I’m excited for our players. They’ve been through a rough stretch and they are staying the course, they are seeking to restore the tradition that is Cedar Shoals football and I’m happy to be apart of it,” Wilkins said. That tradition includes a Class 4A (highest class in Georgia at the time) runner-up finish in 1995 to Josey. Cedar Shoals (1-4; 1-3) will look to win its second straight game since on the road against region foe Loganville. Heritage-Conyers (0-5; 0-4) will travel to region 8-5A leader Lanier (5-0; 4-0) next week. Lanier was off this past week.